Do you belong to Splitcoaststampers? If you don't you should. It is probably the biggest and best source of papercrafting information and inspiration there is. I have an account there, but I haven't posted a card for quite some time. I just don't find the time. But I do use their tutorials extensively and I love their weekly newsletter! It's free to join and an invaluable asset, plus it's a place where you can display your creations and get lots of loving feedback. All this to say that I often google a technique or theme and I come up with either a SCS (Splitcoaststampers) sample or tutorial. 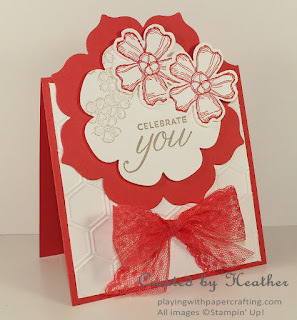 When I searched Pinterest for some new fancy fold techniques, I came up with a sample on SCS using the Tent Topper fold and decided to use the technique for one of my own creations using the Birthday Blossoms Stamp Set from Stampin' Up! I really like this stamp set for the blossom images and the great sentiments. I think it's going to get a lot of use! The base of the "tent" is a piece of Watermelon Wonder cardstock cut at 4 1/4" x 10" and scored at 5". 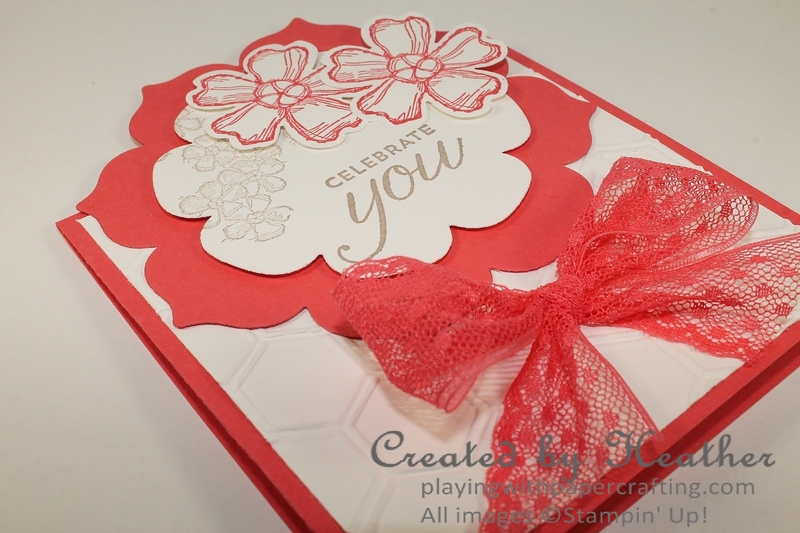 I've added a 4" x 4" piece of Whisper White embossed with the Honeycomb embossing folder and a darling bow made from the Watermelon Wonder Dotted Lace Trim. Then I dug out my Floral Frames Framelits. I don't use them half as often as I should. They are really quite versatile and pretty. I used the second largest frame to make the Watermelon Wonder flower shape which is glued on to the card base, but extends at the top to bring the whole card to 5 1/2", so it will fit inside a standard envelope. I used the next smallest framelit to cut the Whisper White shape and stamped it with the spray of little blossoms in Tip Top Taupe ink and the sentiment, also from Birthday Blossoms. The flowers were stamped on Whisper White with Watermelon Wonder ink and punched out with the coordinating Pansy Punch. It is important to find out which orientation of the blossom stamp matches with the punch. I always mark a B for bottom on my stamp so I know which petal to have at the bottom of my page to make the punching out easy. The flowers are mounted with Stampin' Dimensionals to the Whisper White, which in turn is mounted with Dimensionals to the Watermelon Wonder flower shape. 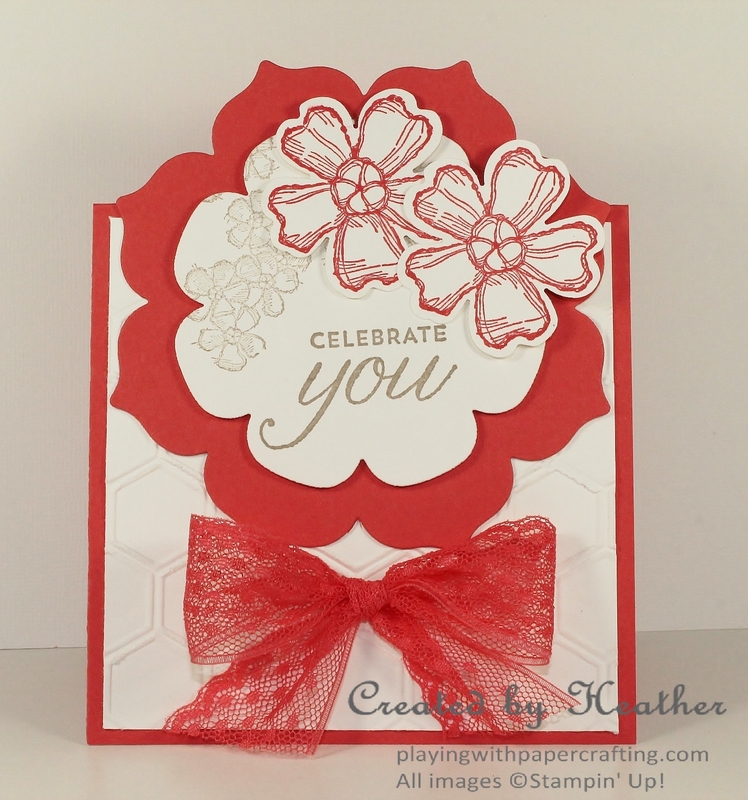 This is very easy to complete and just adds more variety to your card making.